Click on any image for a larger picture and full description. - The church was located three miles south and two miles east of Cairo in section 5 of Harrison township in the northeast corner of the section. 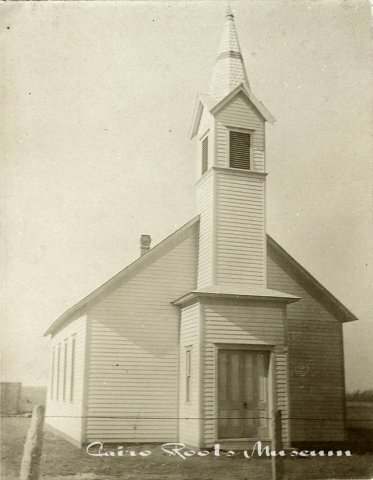 It was formed in 1898 and many of the old settlers in the neighborhood attended the church. The Berwick school held their Christmas programs there. Later the building was used less and less and finally was sold and torn down for the lumber. The proceeds from the sale and the large bell were given to a church in Grand Island. The museum is located inside the Cairo Community Center, two blocks west of Pathway Bank.